Back row, left to right: Ashish Solanki (Maryland), Kyle Wanner (North Dakota), John Binder (Alaska), Jim Williams (FAA), Randy Burdette. Front row, left, Chris Willenborg (Massachusetts) and Michael Huerta (FAA). NASAO has a long history of partnering with state, federal, and private entities of mutual interest through Memorandums of Understanding (MOU). NASAO partners annually with various agencies to identify and document specific initiatives of mutual interest. The first MOU with the Federal Aviation Administration (FAA) was signed by former FAA Administrator David R. Hinson in 1996. In a testament to the success of NASAO partnerships, the MOU was subsequently renewed in 2001 by Administrator Jane Garvey in 2007 by Marion Blakey and again in 2012 by Acting Administrator Michael Huerta. This MOU establishes a cooperative agreement between the FAA and NASAO to continue its long-term partnership in support of FAA’s mission to provide government products and services to the aviation industry. The Federal Aviation Administration (FAA) is responsible for the safest, most complex air traffic system in the world. Runways signal the beginning and end of that system. The surface environment at all airports, and specifically General Aviation (GA) airports, are challenging for maintaining safety. The FAA is committed to working with industry partners to develop and deploy runway safety solutions that benefit everyone. As a fellow advocate for advancing aviation safety, the National Association of State Aviation Officials (NASAO) is partnering with the FAA to seek best practices, disseminate information and collaborate on runway safety practices. This agreement provides a framework for cooperation and encourages collaboration between the two organizations. It promotes effective communication in order to advance efforts critical for safety and efficiency. FAA and NASAO will explore methods of working collaboratively to provide and disseminate information on runway safety in order to reduce both incursions and excursions at controlled airports. Goal: Work in partnership to enhance administration of state block grants under the Airport Improvement Program. Goal: Collaborate to improve airport land use policies, strategies, and guidelines, to better address encroaching incompatible land uses. Goal: Work in partnership to provide AVSED outreach activities within the states. Current goal is to accomplish a minimum of one joint FAA/NASAO AVSED initiative per region, per year. Goal: Promote information sharing on decommissioning of Navaids and transition to a performance based navigation service. Goal: Collaborate to enhance the process and prioritization for FAA establishment of instrument approach procedures. Goal: Explore methods of engaging the states in the promotion, facilitation, and implementation of the NextGen system. Goal: FAA and NASAO will explore methods of working collaboratively to provide information on current and proposed UAS rules and authorization of UAS operations, enhance information sharing and increase awareness of UAS activities within the states. Goal: NASAO, FAA and USDA APHIS will explore methods of engaging the states to work with their respective airports to increase wildlife strike reporting, data gathering, and increasing general outreach concerning wildlife hazards to aviation. 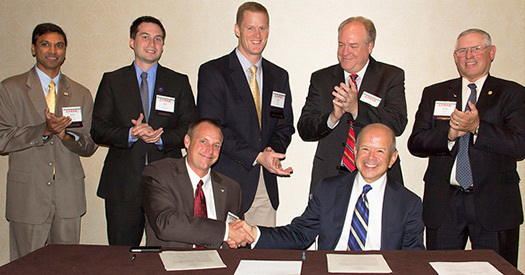 Goal: The FAA/NASAO partnership will focus on providing educational outreach and subject matter expertise to the aviation community regarding Runway Safety operations, regulations and related issues.